Da Jandy's Blog: Election review in Nigeria; State Guber elections as a readily available specimen. Election review in Nigeria; State Guber elections as a readily available specimen. It's safe to say that its only on social media and group discussion that people talk bad of APC. But when it comes to exercising their franchise, people rush to vote for them. They did it in KOGI, EDO and now ONDO state. 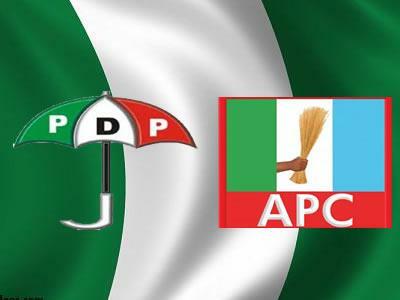 It is trite at this juncture to state the obvious; that APC, the federal ruling party is here to stay. Of course this assertion is not based on mere opinion but rather it is based on recent happenings in the political terrene of Nigeria. Before I delve into that discussion at all, I'll like to roll out the requirements to contest for the office of a state governor in Nigeria as entrenched in the constitution. The position of a State Governor is provided for by the Constitution in Section 176. *and such candidate that has been educated to at least School Certificate Level or its equivalent. *and Persons who presented a forged certificate to INEC. That been exhaustively outlined, I would now state my own opinion on the subject matter. The Election in Edo and Ondo would be my focus point owing to the fact that those states were the ones I focused a search light on in order to reveal the secret behind the APC victory at the polls. Truly Truly, I have found what I tag "reasons for APCs successes at the polls". Also, please note that this analysis is issue based and absolute deviod of bias on my path. The Edo State election was conducted on September 28 2016, and to our surprise, the candidate of the APC who was not until his victory at the controversially conducted primaries an active politician, emerged victorious with a landslide victory. So many tongues wagged but after all said and done, Mr. Godwin Nogheghase Obaseki is the executive governor of Edo state as you are reading this write-up. Many persons even myself still believe that the good Pastor, Osagie Andrew Ize-Iyamu ought to be at Osadebe Avenue as we speak but from facts and figures which we were privy to courtesy INEC, that is not the case. The PDP failed on its part to function adequately in the eight years they were in power in the state. This in turn rubbed off on the good Pastor who served as SSG during the failed tenure of the PDP in Edo State. From all frontiers, it is safe to say that Ize-Iyamu did better in his campaign and even in the debate organised by various media outlets. Despite all these, the minds at least from the results announced showed that the Edo people were not willing to spite their then governor Comrade Adams Oshiomole who within 8 years of governance, turned around the state for the better in all ramification. It is clear that the Head of Oshiomole's economic team, rode on the strong wings of his predecessor into victory, thus leaving the good Pastor, Osagie Ize-Iyamu to water the bad seeds sown by his former boss some 10 years ago. I for one, thought that with the much vexatious words spoken against the President who is an APC Man, and also the lack of oratory prowess by our governor at the debate, it would be easy for Ize-iyamu to clinch unto victory; But this was not the case this time. Godwin Obaseki secured victory over our good Pastor. This feat further cemented the rate at which APC governors have come a long way in election winning matters. It would be a failure on my path if I don't reiterate the fact that the National Chairman of the APC is actually a former Governor of Edo state, and so Him securing his state for his party further added a feather to his already glorious cap. The Edo state is in the hands of the APC at least for the next four years except the electoral tribunal says contrary and the chance of this happening is infinitesimal. Now heading to the most recent victory of the APC, which is that of Akeredolu Rotimi (SAN), we would all agree that with this victory, nothing is impossible for the APC at this rate of speed in their conquering conquest, winning a whopping 14 out of 18 LGA's. It is no news that the PDP gubernatorial election candidate in Ondo state Eyitayo Jegede (SAN) had little or no time to campaign and also due to the factions in his party, had not quite a huge support. Jimoh Ibrahim who was the factional party's candidate safe for few days to the election when he was sacked by the court thereby bringing in Eyitayo as the candidate of the PDP, didn't quite like the arrangement and instead of rallying round his party, zoomed off like a political hallelujah boy and went to support the candidate of the opposition party in Ondo thereby switching his camp and endorsing the APC candidate fews hours to the announcement of the election results. It must not escape mention here again, that the APC rode on the in house mumbo jumbo presently plaguing the PDP and it paid off by them securing the victory thereby putting the power of incumbency of Mimiko to shame. This is a clear pointer to the fact that a house divided against itself can never stand let alone surmount the easiest of challenges thrown at it. The PDP might just be in for a tough one come 2019 if the APC continue to sustain their unbeaten run at the polls till 2019 general elections. If we actually want to have a democratic Nation and also a multi party one at that, then the PDP who are the largest party in West Africa, would need to get their acts together and become a single party devoid of factions and internal rancor so as to become a formidable opposition come 2019. All hope is not lost in this fight because eventually the PDP would have no choice than to receive sense and stop costing their candidates the post they run for due to a bad and confused platform. All said and done, the APC would continue to fly high pending the PDPs rejuvenation and bouncing back of same into victory. Good points bro... If the PDP knows what's good for them and indeed the populace,they should get their act together... Right now, they are not even a credible opposition. Good point bro. If the PDP know what's good for them,they should go for one thing called UNITY.